Former D-backs general manager Dave Stewart has joined the Tagg Romney-led ownership group that is aiming to purchase the Miami Marlins from current owner Jeffrey Loria, reports USA Today’s Bob Nightengale. Major League Baseball officials have been informed that Stewart has been added to a group that already includes Hall of Fame lefty Tom Glavine, per Nightengale. According to Nightengale, Stewart had initially assembled his own team of investors in an effort to purchase the Marlins but has now instead joined the Romney team. Moreover, Nightengale writes that it is believed that Stewart would run the Marlins’ baseball operations department if Romney’s group ultimately succeeds in buying the team. Specific details of the arrangement aren’t yet known and may not even be firmly established just yet, however; for instance, FanRag’s Robert Murray tweets that Stewart would be an advisor but would not have a direct seat in the front office. It’s possible that there are various scenarios being bandied about, though further clarity will surely emerge with MLB’s owners meetings looming later this month. The South Florida Sun Sentinel reported on Tuesday that Romney’s group upped its bid from $1.1 billion to top the reported $1.34 billion offer of the Bush-Jeter group, and Nightengale indicates that he’s heard the same thing. The Romney-led group and the Bush-Jeter group are reportedly the two most serious suitors for the Marlins, though FanRag’s Jon Heyman reported earlier today that there could be at least one more serious group in the mix: a team of investors led by Dana Pawlicki of Stonington Capital Partners. Heyman also noted, though, that Pawlicki’s group could also be vying to join up with one of the two perceived front-runners. It remains to be seen precisely what would happen with Stewart’s agency, Sports Management Partners, in the event that the Romney group is approved by Major League Baseball. Certainly, Stewart wouldn’t be allowed to continue on as the head of the agency and a partial owner of the club and a lead decision-maker for a franchise’s baseball operations department. When Stewart was named GM of the Diamondbacks, his agency was turned over to business partner Dave Henderson, so perhaps a similar arrangement would follow suit should he land with the Marlins. The Diamondbacks ousted Dave Stewart from the GM seat yesterday, bringing his tenure to an end after just two years. Stewart discussed his feelings on the matter with Bob Nightengale of USA Today, who described the scene yesterday as chief baseball officer Tony La Russa informed his long-time friend that he’d no longer be with the organization. That order, of course, came from above La Russa’s head, with managing partner Ken Kendrick and president/CEO Derrick Hall deciding it was time to move on. 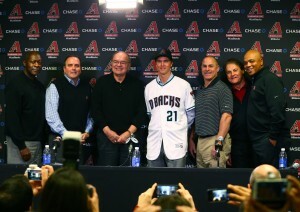 La Russa’s own fate remains to be determined, but he won’t control the organization’s baseball operations any longer. Stewart expressed little in the way of regret, explaining that he believes he ought to have been retained but also that he will land on his feet. After all, the long-time big league hurler has compiled a rather varied resume following his playing times. Most recently, before heading to Arizona, he served as a player agent. What Stewart won’t be doing is airing grievances against the Arizona organization. While he acknowledges that he was “angry” when he left the Blue Jays organization 15 years ago after being passed over for an open GM seat, Stewart says that he’s “not angry this time.” Instead, he said, it’s “almost a relief.” And though he and Kendrick “were oil and water,” Stewart says that was just a reflection of personality differences; he does not “have anything bad to say about” the D-Backs owner.